Since today is the last day, I'm just going to write down the most important information from first!. 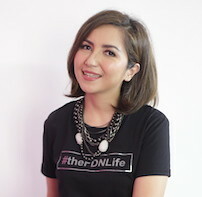 Mommies Daily and Bodrexin is throwing a blogging competition. The Prize? Three Kate Spade goodies!. If you don't have enough time to write down a full entry today, you can still participate in sending your kids' fingerprints into Bodrexin Facebook page and they will turn it into a batik motif. How cool is that? 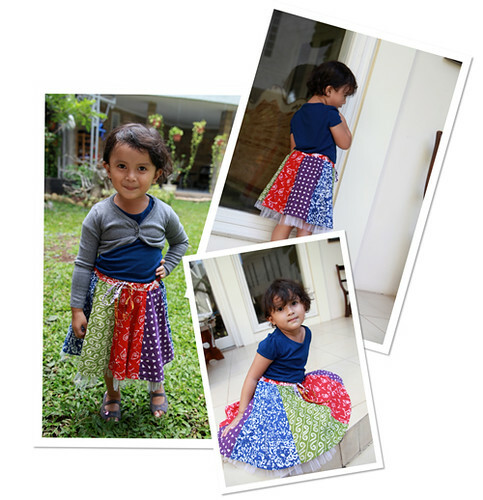 Above is pictures of Jehan with her favorite batik skirt, lined with a white tutu that makes her feel like a ballerina. Ballerina in a batik skirt, why not, right? :D. Batik now is no longer associated with the boring brownish color that is worn to formal events. Wherever we turn now, we always see people with colorful and stylish batik clothes that make us even more proud of our traditional heritage. The people in the industry is getting more and more creative in producing different kind and style of batik. Kids clothing are not an exception, proven by the skirt that Jehan wears in the picture. It's indeed a good and easy way to introduce batik to kids and to make them proudly wear it on a daily basis. They look much better in colorful batik than they do in Spongebob or Dora t-shirt, don't you think? So cute! This dress is adorable! !